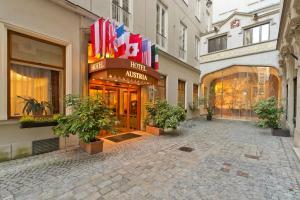 Hotel Austria is located in the very heart of Vienna, just a few minutes' walk away from the major sights of the historic centre such as St. Stephen's Cathedral. All rooms are traditionally furnished and offer all modern comforts. The public areas and the quiet terrace are the perfect spots for relaxing and unwinding. See one of the friendly receptionists, who always have a special recommendation on what to do and see in and around Vienna. The front office staff will be more than pleased to assist you in arranging tickets for the opera, theatre and concerts, or in organising a sightseeing tour for you. The hotel's unique location in a small, traffic-free dead-end street guarantees an undisturbed good night's sleep. The Spanish Riding School, the Hofburg (Imperial Palace), the State Opera and the big museums are just a short walk away from Hotel Austria - Wien. 2 important underground lines (U1, U4) offering direct connections to Schönbrunn Palace and the Vienna International Center (UN), as well as many tram lines, are only a few metres away from the hotel. Vienna International Airport can be reached easily and quickly by using the shuttle bus from nearby Schwedenplatz.